More Footage of Recent Reconstruction	Footage donated by Sam Hess and C. T. Hess of Stillwater, Maine. Filmed using a Phantom 3 quadcopter. The Boardwalk is closed for the season. Boardwalk director was recently interviewed by Craig Colson of WVII, ABC7/FOX22. We are actively working to reconstruct the boardwalk. Learn more about how you can support the boardwalk reconstruction campaign, and and learn about volunteer opportunities. 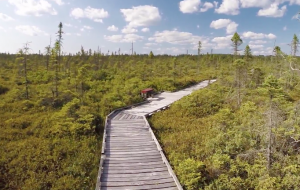 The Orono Bog Boardwalk is a premier destination in the Bangor/Orono area for persons wishing to experience the beauty and fascinating plants and animals of a Maine bog. The 1-mile boardwalk loop trail begins at the forested wetland edge in the Bangor City Forest, and after 800 feet crosses the Orono town line into the portion of the Orono Bog owned by the University of Maine. Along the way the boardwalk passes through a wide range of changing vegetation and environments on its way to the open, peat moss carpeted center of the Orono Bog. The Bog Boardwalk is a joint venture of the University of Maine, the City of Bangor, and the Orono Land Trust. The Boardwalk is manged by a committee that includes Jim Bird, Director, Jerry Longcore representing the Orono Land Trust, Tracy Willette, representing the City of Bangor, and Dr. Erik Blomberg, representing the University of Maine. 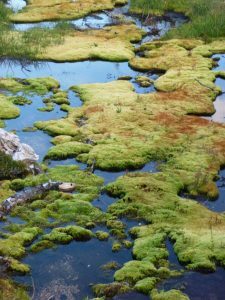 The Founding Director of the Bog Boardwalk was Dr. Ronald Davis, Professor Emeritus at the Climate Change Institute, University of Maine. Boardwalk visitors encounter a series of well designed, full color signs with illustrations of common species of bog plants and animals, and explanations to go along with them. Many visitors return to the boardwalk, again and again, to observe the colorful bog and to absorb its tranquil beauty over the changing seasons. The boardwalk is a wheelchair-friendly facility. Benches for rest and contemplation are provided at least every 200 feet. We encourage you to take advantage of nature walks scheduled for next season, which are trips guided by experts in their respective fields that provide insights into the ecology and natural history of the flora and fauna found along the boardwalk. The Boardwalk is undergoing an exciting rejuvenation that will increase its safety and durability, and ensure that the boardwalk is available to visitors for years to come. In early 2014 we completed Phase I of this exciting project and replaced the first 105 sections of the Boardwalk with even better sections to help you enjoy this treasure. If you would like to help us with Phase II of this project, just click on Support on the menu bar above. 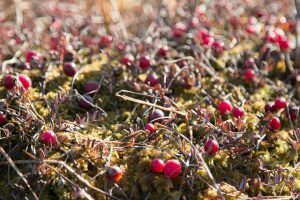 Enjoy your time in the bog! P.S. 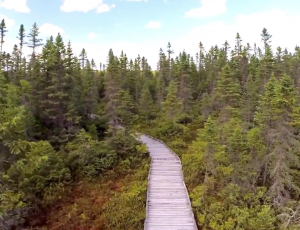 You can learn the History of the Orono Bog Boardwalk, the story of how we came to be. The answers to Bog Frequently Asked Questions will help you understand better this treasure. So that everyone is safe and gains from the experience we have a few Rules for Enjoying the Boardwalk. Bog Walk Video	Footage donated by S. T. Hess and C. T. Hess of UMaine. Filmed using a GoPro Hero 3+. Funding for equipment provided by the Maine Space Grant Consortium grant SG-14-28.